I have one in almost mint condition and one that I am cleaning now that has "DEMONSTRATION RECORD" and "NOT FOR SALE" printed across the record label in gold outline, front and back. Everything looks the same on the second one I have except for the printed message noted. I couldn't find any record of this record. I found this album with a plain white jacket of a thinner card stock and a whole in the center to show the record's label. I don't know if it's a demo (one sent to a radio station) or if the jacket is the inner sleeve. Can anyone help me in determining this? Before I dive into the album itself, let me just suggest that if you’re considering a copy of Time Further Out, that you should search out an Impex edition. Impex has reissued this album on 180 gram black vinyl, with the Impex Records being comprised of those who founded Cisco Music, those who brought those essential later Steely Dan albums to light, infusing them with a sonic delivery that is unparalleled. Impex has managed to actually improve on not only the sound quality, but the spacial representations, where I heard aspects I had not heard before, even on original 1959 pressings. The vinyl itself is dead quiet, exceptionally smooth and has been limited to 3000 numbered copies. As to the jacket, it’s also well represented, arriving in a poly sleeve with an affixed Impex sticker that is impossible to remove without telltale traces. 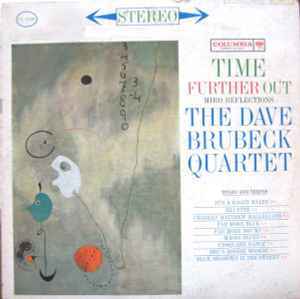 Originally laid down in 1959 by the Dave Brubeck Quartet, which is not to be confused with any of the other Dave Brubeck incarnations, including Dave on piano, Eugene Wright on bass, Joe Morellos on drums and Paul Desmond holding down the alto sax. The record is also known as Time Further Out: Miro’ Reflections, another in a series of continuing jazz experiments inspired by paintings by abstract artists. In this case it was the very visual and kinetic work by Miro’, created in 1925, and featured a descending string of numbers in the right hand corner. These numbers would come to define and represent the time signatures for each tune … ranging from standard 3/4 time to strains of the 9/8 signature that are simply angular and off kilter. Most notable is the manner in which the record unfolds, where the opening track belays a granular structure, then moves into numbers that are more breathy, filled with air and expansive in their nature. Add to that, Brubeck has always managed to deliver music that has actual weight to it, and never more-so than here. There are those who will attempt to suggest that this recording is simply an extension of the blisteringly wonderful album Time Out, where nothing could be further from the truth, as this recording is a continuation of a theme, and not of an endeavor for the sixty very productive and enlightening years of Dave Brubeck. Time Further Out essentially creates, or perhaps captures a wholeness that’s not present on Time Out, due in part to the rhythmic underpinnings that move the music forward, along with the conceptual panorama that’s musically painted. I say painted, as this is not a series of notes fused together, but rather of notes that are layered together, blending and mixing as paint, where notes change in their character when placed next to the notes of other band members, where only when heard in tandem does the quartet manage to offer up the sonic whole of completeness. That being said, this outing was not designed to enhance soloing by any member, meaning it’s all far more harmonic and deeply centered than just about any album you’ll hear from the Dave Brubeck Quartet. Alright, I understand what you’re thinking, and allow me to assure you, both two-two-eye and six-eye original recordings of this album are available in mint condition, and are not expensive. Matter of fact, I have several, both in mono and stereo, though not a one of them is as dynamic or voluminous as this issue, and that includes the production, meaning the vinyl itself is very quiet and smooth when spinning on your turntable. I'm not shouting here, I'm impressing, THIS RECORD SOUNDS BRILLIANT, A DYNAMIC PRESSING, I ACTUALLY CAN'T THINK OF ANYTHING THAT WOULD IMPROVE THIS RECORDING! my copy sounds muddy. i don't know if this is about it's condition or the pressing quality.. I have a Canadian pressing from 1961 that is Mono CL 1690. The label on the record is the Canadian Burgandy Columbia 6 eye.